I am very much not the target market for the 2016 GMC Yukon XL Denali 4WD. 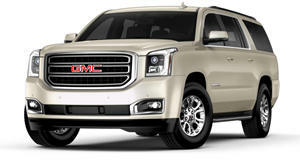 GMC sees this vehicle as a family hauler, and as well it should given the spacious interior and seating for seven. I am very far away from being a man who needs to haul a family. Hell, I don’t even have a dog or a girlfriend. But that didn’t stop me from driving a Yukon Denali XL for a week. My initial thought upon climbing into the driver’s seat was that the full-size SUV was about as big as my apartment. In fact, one of the first things I did was fold down the second and third row of seats—both folded down with the push of a button—so that I could lay down. With both seats tucked away I found the Yukon XL to be quite comfy. Why pay rent when for $80,6050—the price of my tester including $8,930 worth of options—you can get an apartment on wheels? Once I folded the seats back up and took stock of the SUV I started to wonder what the hell I would do with it. I have more than six friends but couldn’t round all of them up for an epic road trip. 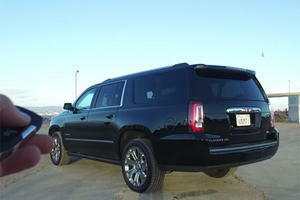 The Yukon’s boxy look and all-black exterior made me feel a bit like Jack Bauer. But there was no way in hell I was going to try any sort of spirited driving in a car measuring 18 feet and weighing 6,009 pounds. And then it hit me. There’s nothing more American than making a solo trip to Wal-Mart in an SUV built to fit seven people and tow a trailer (the Yukon XL’s towing capacity is 7,900 pounds). So, I hopped in the driver’s seat and set a course for Wal-Mart. In any other part of the world this would be a quick trip down the street. But San Francisco hates Wal-Mart with a passion, thus turning my short drive into a longer one. In the first five minutes the Yukon XL proved just how small it could make a big city feel. I was heading down a one-lane street when I spotted a city bus headed my way. In a moment too perfect to be scripted both the bus and I slowly attempted to wiggle by one another while traffic backed up. Driving in the city is where the SUV suffers. It’s incredibly heavy and feels like it. The four-wheel disc brakes get a workout at every stoplight as they struggle to bring to a halt three tons worth of mass. While many people—myself included—bemoan the rise of electrically assisted power steering I found it helpful in guiding the Yukon in and out of lanes that it was much too big for. My tester was equipped with GM’s 6.2-liter EcoTec3 V8 making 420 horsepower and 460 lb-ft of torque, figures that the automaker says are class-leading. All that action is mated to an eight-speed automatic transmission. Although GM and Ford have similar names for green engines, EcoTec is not the same as EcoBoost. GM eschews turbocharging in favor of cylinder deactivation, continuously variable valve timing, direct injection and an advanced combustion system. The result is a V8 that roars loud and proud whenever you hit the gas yet sits quietly at idle as the cylinders not in use shutdown. GM says the eco-friendly V8 will achieve mpg splits of 14/20/16. Around town I achieved a woeful 8.9 mpg but on the highway I was pleasantly surprised to average 18.9 mpg on the first half of my Wal-Mart run. All told I averaged 16.3 mpg on the trip which was a hell of a lot better than I expected. Denali trims come with noise-cancelling tech which made my highway drive nice and peaceful, that is until I fired up the 10-speaker Bose sound system. The system sounded good but wasn't overly impressive, while the infotainment system itself stood out for all the wrong reasons. I will give GM props for making the controls extremely user-friendly and intuitive, both on the system itself and the steering wheel, but the layout is incredibly basic and the 8-inch touchscreen looked dated and small. Although the infotainment center looks like it’s stuck in a time before smartphones existed there is Apple CarPlay and you can set up a 4G LTE Wi-Fi hotspot. On the highway I alternated between finding the ideal seating setting and trying to resist the temptation to blow past slower cars. The Yukon XL will sip gas, relatively speaking. But the power is definitely there if you want it, with the Yukon suddenly feeling lighter than its curb weight once you hit the gas. Once I got to Wal-Mart it became clear to me what I needed to do: eat McDonald’s in the back seat. After meandering around the store for an hour and exiting with nothing useful I made a beeline for the car. I sat in the second row of seats, both of which are power adjustable and heated. The Yukon XL has a 2-2-3 design which provides a wealth of space in the second row and a surprising amount of room in the rear. There’s a screen that pops out from the roof and headphones in case the kids in back—or the lone man eating a McChicken—want to watch a movie. While I have had crazier experiences behind the wheel this year I genuinely enjoyed my afternoon at Wal-Mart with the Yukon. The V8 sounds awesome and won’t give you flashbacks to the nightmare that was the mpg ratings of full-size three-row SUVs circa the late 1990s. Ford may have the branding but the EcoTec3 engine in the Yukon is legit, at least from what I gathered in my limited time with it. Very few cars can actually comfortably hold the amount of people they have seats for. This thing is as big on the inside as it is on the outside and much more comfortable too. Perhaps the Yukon XL Denali’s biggest sin (aside from that horribly dated infotainment center) is that it is not the ostentatious Cadillac Escalade, which starts at $73,965.